This post is as it is reproduction of an article by research scholars of Tata Institute of Fundamental Research. This post will be removed if no approval got or there is a objection from the original authors to post their post on this blog! Astronomy arises very early in a civilisation and it evolves as civilisation advances. It is thetrefore logical that a civilisation of the size of the Harappan civilisation would have a vibrant knowledge of astronomy and structures to keep track of the heavens. These would have been useful for calendrical (including time of the day, time of the night, seasons, years and possibly even longer periods) and navigational purposes apart from providing an intellectual challenge to understanding the movement of the heavens. We suggest that structures dedicated to astronomy should have existed in all major cities. Dholavira, situated on the Tropic of Cancer, is believed to be a port city for trading with West Asia during the peak period of the Harappan civilisation when the sea levels were higher. We have therefore searched for an observatory in Dholavira. The bailey at Dholavira slopes up towards the north and has two circular structures aligned to cardinal directions with openings in exact North and exact West. These two structures have layout, one opening in exact north and the other in exact east, which is significant in itself. We have surveyed these structures in detail. We simulate the movement of the sunlight inside the structure by assuming reasonable superstructure with a strategic hole in the ceiling. We show that the interplay of image and the architecture of the structure and its surroundings all seem to suggest that it is consistent with being an observatory. If this is true, then the Harappan observatories had fundamentally different design ideas from megalithic structures and were more akin to similar structures found in South America several millennia later. Harappan civilisation is the largest and the most sophisticated of the Bronze Age civilisations (Wright, 2010; Agrawal, Joshi, 2008, Possehl, 2002) in the world. During its peak period of 2500 BC to 1900 BC, it covered an area of more than 1.5 million square km and traded over several thousand kilometres to west Asia and the Horn of Africa. The civilisation itself was settled along the banks and upper reaches of two major rivers east of the Thar Desert. One of its most interesting features is several large and medium sized settlements in the present day Kutch region of Gujarat (Rajesh and Patel, 2007). Studies of the sites in the Kutch region suggest that the Little Rann of Kutch was covered with water with a few scattered islands. 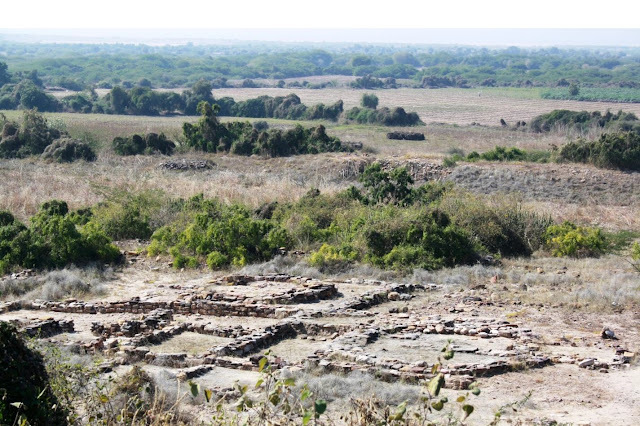 Several Harappan settlements have been found along the higher points in the Kutch region suggesting that the sites in Gujarat were used as trading outposts from which the Harappans traded with West Asia. This is further reinforced by the nature of settlements, ports and industries found in this area. Several of these are urban centres and there are, villages, craft centres, camp sites, fortified places etc (Ratnagar, 2001). 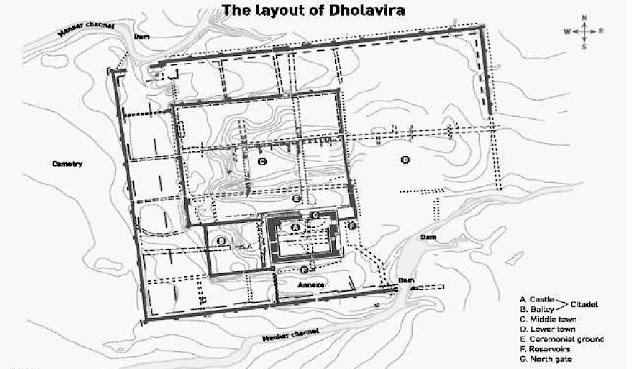 Dholavira is an important city of the Harappan civilization (Joshi, 2007). It is the largest site in Gujarat region. Located in the Little Rann of Kutch, it was set up on the banks of two seasonal rivulets (figure 1). It is close to a port from where extensive trading is believed to have taken place. Figure 1: Layout of Dholavira (from the Website of the Archaeological Survey of India http://www.asi.nic.in /asi_exca_2007_dholavira.asp). The city is divided into smaller sectors based on understanding of such cities in other parts of the world. The precise reason for any region can only be conjectured. 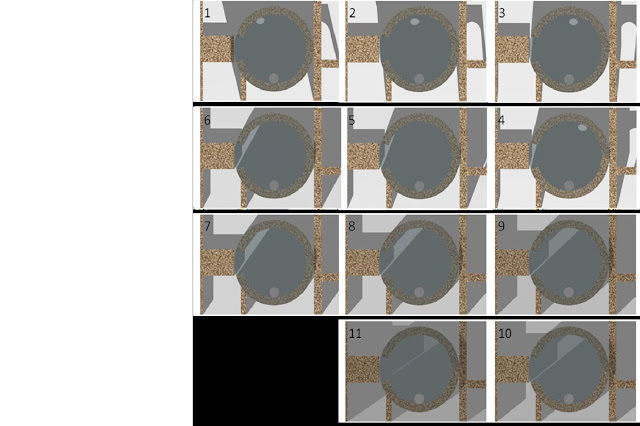 The dimensions of different parts of the city are given in table 1. The region of interest is the region marked out as Bailey in figure 1. It lies to the west of the Citadel which is an exclusive place of residence which may have housed the most important people in the city. Figure 2: Picture of the structure in the bailey at Dholavira. There are two circular structures one in the bottom right of the picture and one in the centre. The one on the left has a central structure that faces exact North. A photograph of the Bailey taken from the Citadel is given in figure2. In the Bailey region of the city is a structure with a plan-form that is markedly different from the rest of the structures in the city and from Harappan plan-forms in general. It consists of the plinth and the foundations of what was probably a 13-room rectangular structure, of which two are circular rooms embedded within. It is located west of the Citadel and is near the edge of the terrace forming the Bailey with a drop in the west. The flat featureless horizons to the north, west and south are visible without any obstruction, while to the east the mound of the citadel obscures the horizon to a large extent. The ground slopes down to the south, where one of the artificial water reservoirs is located which would have permitted a clear view of the southern horizon. 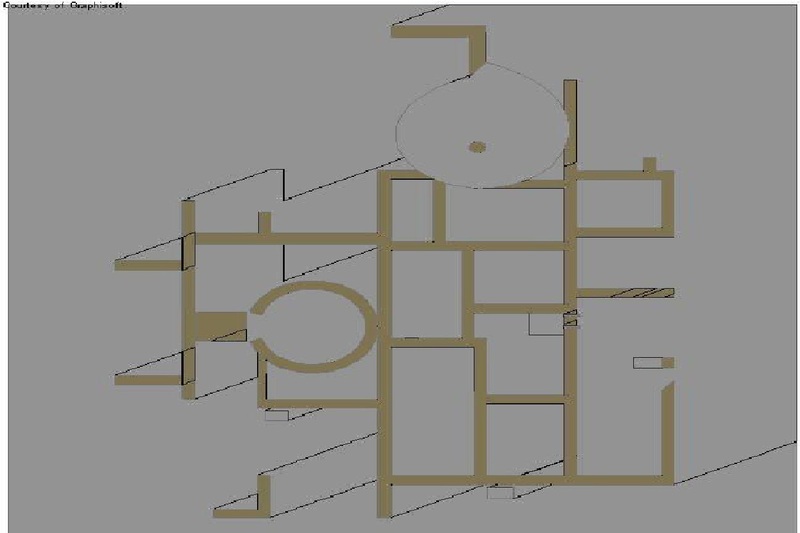 As can be seen from the figure 2 (for a ground plan of the same, see figure 3), the structure under discussion consists of components of circular and rectangular shapes in plan. Since most other residential and workshop buildings in Dholavira are rectangular, it is generally assumed that these belong to the Late Harappan or even later period. In addition, it is built on top of some pre-existing rectangular structure. 1) The structure consists of both rectangular and circular construction built to interlink with each other. 2) Structurally, in terms of wall construction and the nature of masonry work, the quality is consistent with the masonry work found in the rest of Dholavira. We also suggest that the circular structures were designed for non-residential purposes. This is because of the following reasons. 1) The rectangular structures adjoining the circular structures have bathing and other utilitarian areas which are not evident in the circular structures. 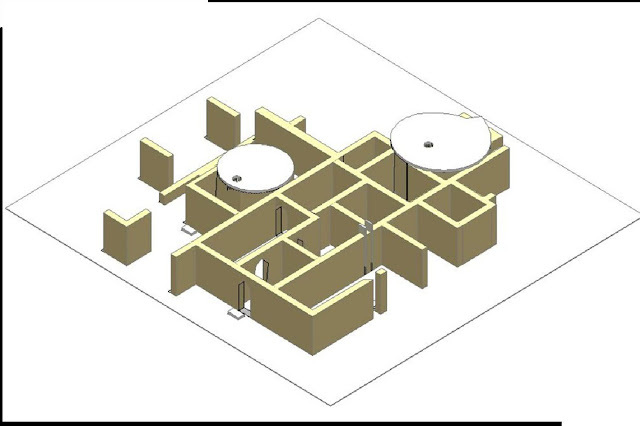 2) Rectangular rooms are typically connected to one or more rooms while the circular structures have only one opening. 3) The circular rooms have very small internal area which will not make it convenient for residence unless it was connected to other rooms which is not the case with these two structures. In addition, the northern circular structure has a straight wall that divides the space into two, rendering each half too small for independent use. However, it also clear that the structure is on top of some other structures which also seem to be of mature Harappan period. We therefore suggest that the entire Bailey area was reset at the peak period of the civilisation by filling it up in a manner that gives it its present shape. We have surveyed the remains of the structure (Fig. 3) in December 2010 and noticed a few unique features of the construction. 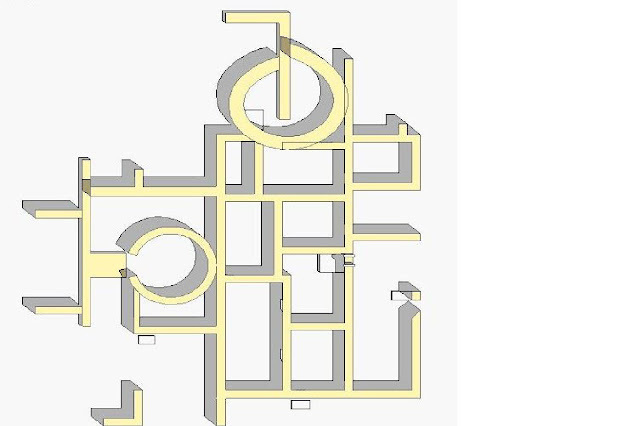 Firstly, at three places where the East – West oriented cross walls meet a North – South oriented wall, their points of intersection are offset by an amount equal to the thickness of the wall. Since the obvious common sense approach would have been to carry on the cross walls in the same line, it looks deliberately done as has been done in other parts of Dholavira. 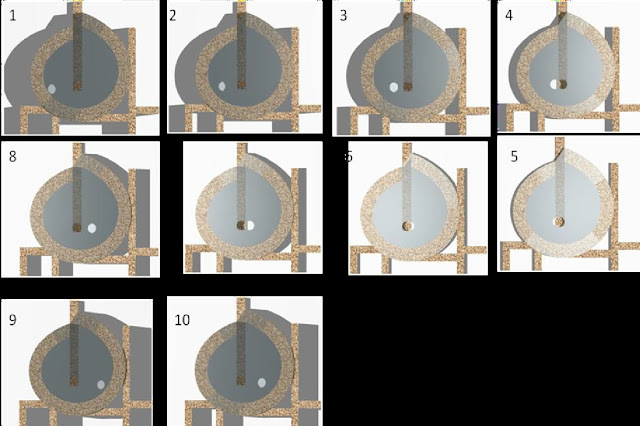 There are two circular rooms – one in the north (figure 4, henceforth Structure 1) and one in the west (figure 5, henceforth Structure 2). Of these, Structure 1 (figure 4) is like a spiral in plan. The line of the outer surface of its wall comes in line with its inner line at its northernmost point as it completes the structure. Structure 2 (figure 5) is nearly circular with an average diameter of 3.4 m and a wall thickness of 0.75m;. A straight wall of thickness 0.75m extends north-south into the room at this point for 4.0 m. A wedge shaped segment 1.5m on two sides and bounded by the curvature of the circular wall of the room is situated in the south west quadrant of the room. 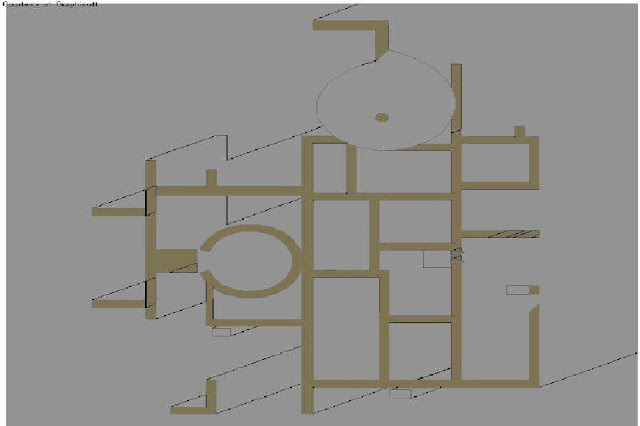 Figure 3: Showing the plan of the structure with circular rooms in the Bailey at Dholavira. North is to the top. In addition to the survey, there are the following unusual aspects to the entire area. 1) Unlike all other regions, the Bailey area rises from South to North with an estimated inclination of 23.5o which corresponds to the latitude of the place. Hence standing at the southern end of the Bailey, the celestial North Pole would be seen at the top of the slope. 2) While the city walls of Dholavira is inclined by 6o + 0.5 to the exact north, the two circular structures point exactly to the northern (0o + 0.5) and the western (270o + 0.5) directions. 3) Unlike other structures, both have clearly laid out plan forms, further emphasizing the direction of importance for the structure. 4) Structure 1 has a small platform in the south-west part. 5) At the southern end of the Bailey structure are two deep square pits with no steps for entry which would be ideal to observe stars close to the azimuth even in the presence of light pollution, some amount of which would have existed even in those times. We therefore investigate if this structure has any relation to astronomy. 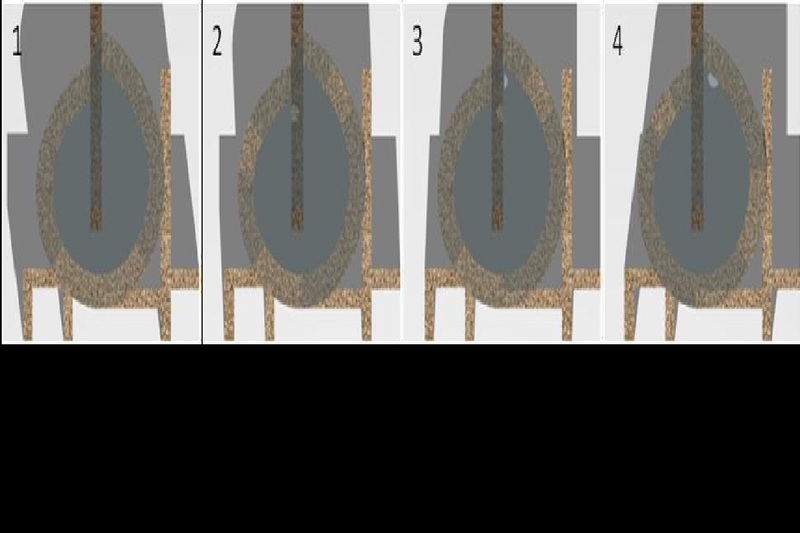 The image of the composite structure in the Bailey, as per our reconstruction, is given in figure 6. 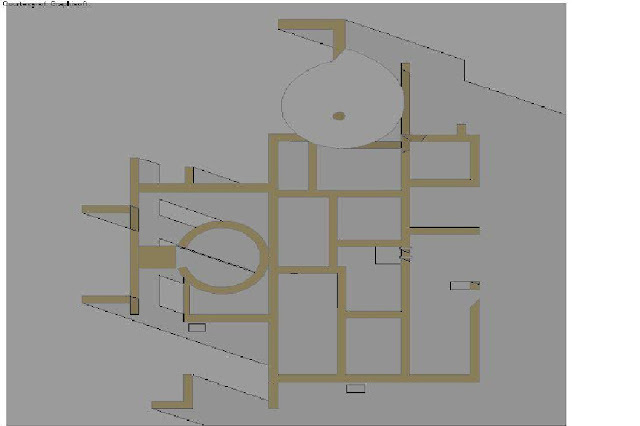 Assuming a height of 2.5m for the structure and entry to the two circular rooms (Structure 1 and 2) via the north and west respectively, we simulated the structure for response to solar geometry for the latitude of Dholavira. 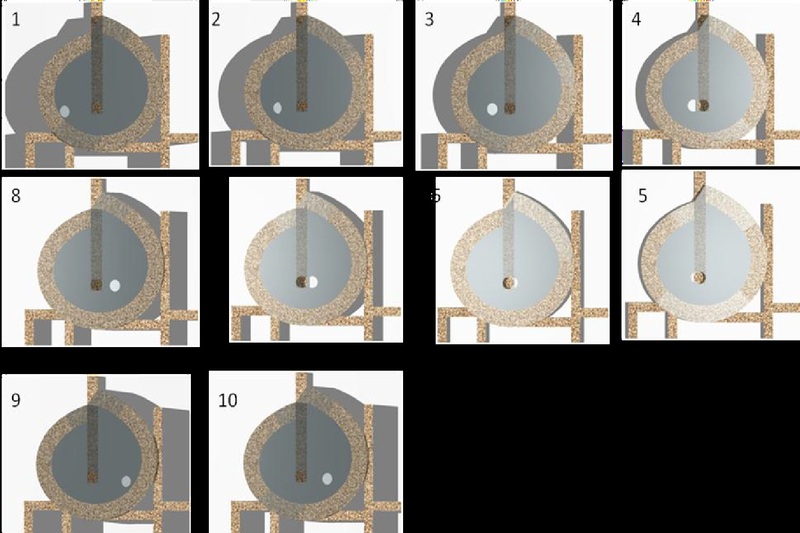 The assumptions and the simulation procedures are detailed below. For the north circle (Structure 1), we assume that the entry is via a break in the 2.5m high circular wall where the straight wall penetrates from the north. The width of the entry is taken as 0.50 m – which is the thickness of the straight wall. The straight wall is taken as a walkway only 0.60 m high. A flat roof was assumed for the structure, with a circular opening 0.50 m in diameter directly above the termination point of the straight wall. In figure 7 we have shown the movement of the image of the circle of sunlight cast by the hole in the ceiling of Structure 1 for summer solstice day. In figure 8 we have given the movement of the circle of sunlight in structure 1 during winter solstice. Upon simulation for summer solstice day, the circle of light cast by the aperture in the roof of Structure 1 slides down the circular wall in the west and across the floor and, at local solar noon, falls directly upon the extreme south portion of the straight wall before continuing across the floor and up the eastern portion of the circular wall. This is expected since we have deliberately positioned the aperture over the southern extreme of the straight wall and the sun is straight overhead at local solar noon on summer solstice for the latitude of Dholavira. But what it is probably significant is that, simulating the movement of the sun on winter solstice for the same geometry, the circle of light travels down the N-W part of the circular wall and when it is on the top surface of the straight wall, its northern edge grazes the bottom edge of the circular wall. Note that at noon, the circle of sunlight is on the 60 cm high platform, grazing the base of the northern wall and when the circle moves to the floor past noon, it grazes the offset wall since the imaging plane is lower. This could possibly explain the strange plan-form of a spiral with the walls meeting offset by the wall thickness in the north. 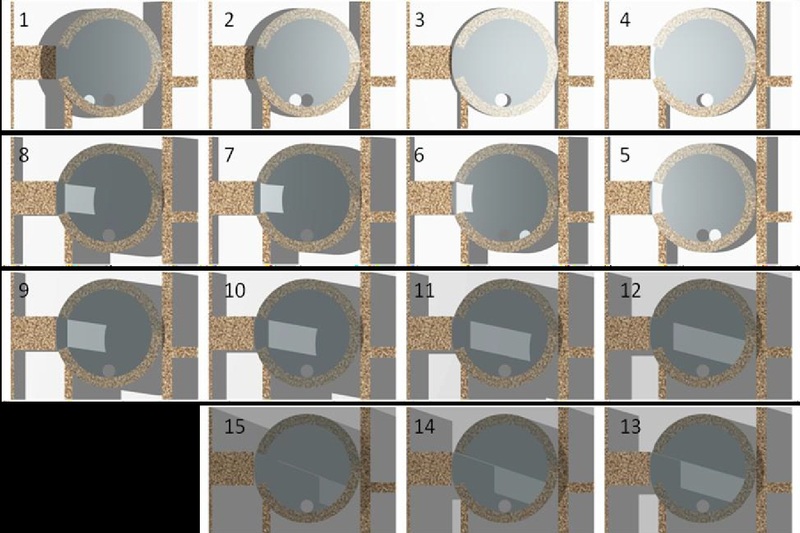 Figure 7: The circle of light cast by the roof aperture for the northern circular structure at summer solstice. 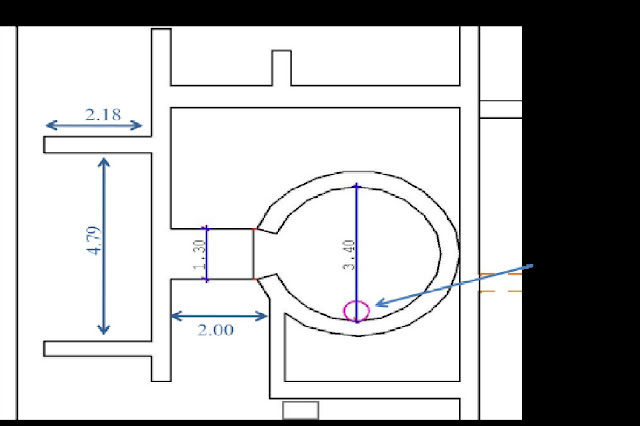 Similarly, for structure 2 (figure 9), we assume that the entry is via a break in the 2.5m high circular wall where the straight wall joins from the west. The width of the entry is taken as 1.30m – which is the thickness of the straight wall. The straight wall is once again taken as a walkway only 0.60m high. A flat roof was assumed for the structure, with a circular opening 0.50 m in diameter at the southern extreme. In figures 9 and 10 we have simulated the movement of the Sun in Structure 2 and the light patterns clearly show that the structure’s design seems to be closely related to the play of the images. Upon simulation for summer solstice day, the circle of light cast by the aperture in the roof slides down the circular wall in the south west and is on the floor at local solar noon, its southern edge grazing the bottom edge of the southern wall before continuing up the S-E portion of the circular wall. This is expected since we have deliberately positioned the aperture over the southern extreme and the sun is straight overhead at local solar noon on summer solstice at Dholavira. Simulating the sun’s movement on winter solstice day for this same geometry, the circle of light travels down the N-W part of the circular wall and when it is on the straight wall, its northern edge passes close to the bottom edge of the circular wall. Figure 9: The circle of light cast by the roof aperture for the western circular structure at summer solstice. Figure 10: The circle of light cast by the roof aperture for the western circular structure at winter solstice. In figure 12 and 13 we have shown the sunlight patterns on summer and winter solstice for Structure 2 and it can be seen that the shadow of two outer flanking walls in the west touches the structure at characteristic locations indicating that these walls were probably made to note the exact point of sunset at solstice days. It is seen that the two sections of E-W oriented walls to the west of the west circle frame the extreme points of setting of the sun as seen from the 1.30m wide slit in the circular wall. In other words, the shadow of the northern wall touches the northern extremity of the slit at sunset on summer solstice day and that of the southern of these walls touches the mid-point of the slit on winter solstice day. The city of Dholavira is on the Tropic of Cancer (latitude 23o 26’ 22”). The location of structure 1 is latitude 23o 53’ 14.0” N; 70o 12’ 44.5”. However the earth’s axis of rotation fluctuates by about 0.5o over centuries (Vahia and Menon, 2011). Hence, we can assume that Dholavira lay exactly on the Tropic of Cancer. Hence the shadows of all the structures would be to the north of the structure except for the local solar noon of Summer Solstice when the Sun would come to the zenith and no shadows would be cast. This is clearly something a civilisation as complex as the Harappan civilisation must have noticed. The Bailey structure of Dholavira is unusual in several ways. It is built on what seems to be an intentional incline that points to the celestial pole. It also has two circular structures, a rare structure for the rectangle- loving Harappans. However, from the workmanship and relation to the neighbouring structures, these structures seem to be contemporaneous to other structures in the Bailey. While structures of the Harappan civilisation do not have stone pathways leading to the entrance, these two buildings have such pathways. The whole city is inclined 6 degrees to the West of north, but the two circular structures in the Bailey have openings that are exactly to the north and west respectively. In addition, the west-facing structure has two walls that are so constructed that their shadow would just touch the entrance to the structure on winter and summer solstice days. We have simulated the Bailey structures by making assumptions about the superstructure such as the height of the walls (2.5 meters) the flat roof. We have also assumed the presence of an aperture of a certain size (which is not crucial to the simulation) and its positioning. However, none of these parameters are at variance with what is known about Harappan architecture (Possehl, 2002). 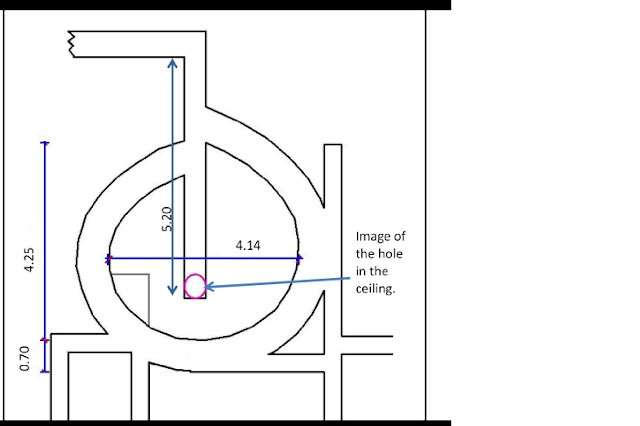 Using these assumptions we have simulated the movement of the image cast by a hole in the ceiling of the structures. The image clearly coincides with important points within the structure. Hence important days of solar calendar could easily be identified by analysing the image inside the room. The narrow beam of light from the entrances would also enhance the perception of the movement of the sun over the period of one year. In the case of Structure 1, what is interesting is that for the given geometry of the aperture above the southern extreme of the straight wall, the northern and southern extremes of the straight wall mark the points where the circle of light is cast at noon on the solstices. A simple long marked plank of wood on the path would allow reading of the calendar in a unique and accurate way, especially if the hole in the roof used here is replaced by a slit. In the case of Structure 2, once again, for the given geometry of the aperture above the southern extreme of the circular wall, the extremes of the north - south diameter of the room mark the points where the circle of light is cast at noon on the solstices. 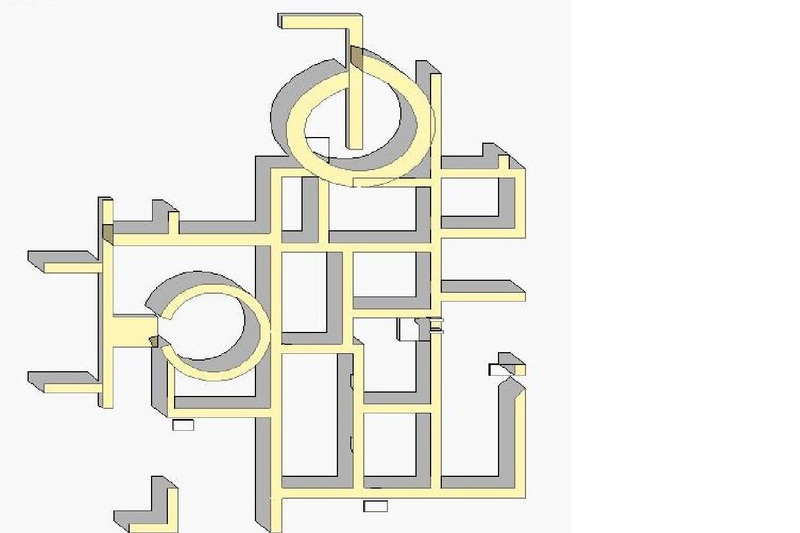 In addition, the positioning and extent of the two E-W oriented walls as well as the slit in the circular wall, respond to the positions of sunset on the solstice days. It is highly implausible that an intellectually advanced civilisation such as the Harappan civilisation did not have any knowledge of positional astronomy (see for example, Vahia and Menon, 2011). However, apart from some suggestive references (Danino, 1984), there has been no positive identification of any astronomy-related structure in any of the 1500-odd sites known today. The structures in the Bailey at Dholavira, however, seem to have celestial orientations inbuilt into their design. More precisely, these structures seem to have a response to the solar geometry at the site inbuilt into their design. It is, therefore, highly probable that these two rooms in the structure were meant for observations of the sun. If so, this is the first identification of a structure used for observational astronomy in the context of the Harappan Civilization. 1) The City of Dholavira is on what is thought to have been an island at that time and is also almost exactly on the Tropic of Cancer and was an important centre of trade. Keeping track of time would therefore be crucial to the city. No obvious structures have been identified in Dholavira that could have aided this. 2) The Bailey has an inclination that corresponds to the latitude of the place and hence, viewed from the south, it would point to the north celestial pole. 3) While the layout of the whole city is 6 degrees to the west of north the two structures of interest have opening in exact North and exact West (with an error of less than 1o). 4) These two structures are not conducive to human habitation and have well defined stone paths leading to and into the structure. 5) A simulation of the nature of the structure and internal movement of the sunlight passing through into the structure by assuming reasonable superstructure with a strategic hole in the ceiling reveals interesting patterns. The interplay of image and the structure of the structure and its surrounding structures all seem to suggest that the structure which is consistent with it being a solar observatory to mark time. 6) The west-facing circle has two flanking walls outside the exit whose shadow touches the entrance on winter and summer solstice. 7) The two square well-like structures at the southern end would provide an excellent location to observe zenith transiting stars even in the presence of city lights, which are certain to have lit prominent places like the Citadel. 8) Arguing from sociological point of view we suggest that such structures had to exist in all major cities and hence our suggestion is consistent with other aspects of this sophisticated civilisation. We therefore conclude that the possibility that the Bailey may be a calendrical and astronomical observatory should be seriously considered. If this is true, then the Harappan observatories had fundamentally different design ideas from, say, megalithic structures of the same function and was more akin to similar structures found in South America several millennia later (Hadingham, 1983). The authors wish to acknowledge the funding for the project from Jamsetji Tata Trust under the programme Archaeo Astronomy in Indian Context. We also wish to gratefully acknowledge the permission given to us by the Archaeological Survey of India to survey the site in 2007, 2008 and 2010. Without this it would have been impossible to do the work. 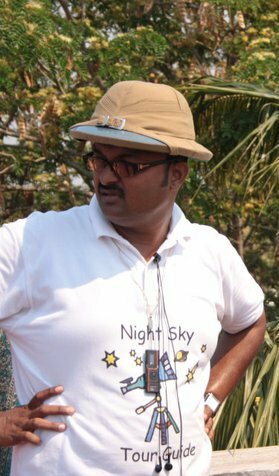 We also wish to thank our friends Mr. Kishore Menon and others whose endless discussions greatly helped in this work. We also wish to thank Prof. Vasant Shinde for his continuing encouragement for this work. We wish to thank Sir Arnold Wolfendale for helpful suggestions. 4. Hadingham, E., 1983, Early Man and the Cosmos William Heinemann, Ltd. London. 9. Vahia M N and Menon S, 2011, Foundations of Harappan Astronomy, to appear in the proceedings of the 7th International Conference on Oriental Astronomy, Tokyo, Japan, September 2010. 11. Wright Rita P, 2010, The Ancient Indus: Urbanism, Economy and Society, Cambridge University press.